CATHOLIC GIFT SHOP LTD - Lourdes Shopping Bag with Stripes and Buttons. 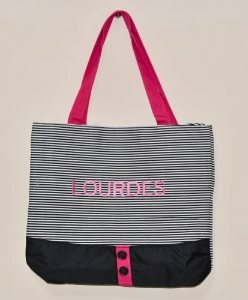 Lourdes shopping bag with stripes and buttons for decoration, the zip is on the outside with an inside zip pocket. The bag is a good size measuring 40cm wide (16 inches) wide and 36cm (14.5 inches) high excluding handles.